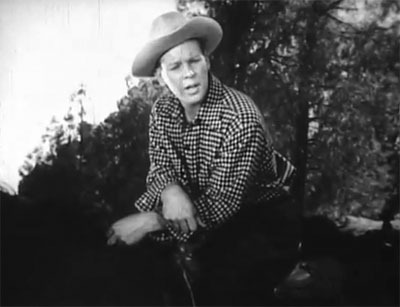 Above: Ralph Hodges in the serial Bruce Gentry (Columbia, 1949). A juvenile sidekick in three of Sam Katzman’s Columbia serials and (briefly) a hero in a fourth, Ralph Hodges made his youthful serial characters seem properly cheerful, enthusiastic, and impetuous–but balanced the boyish aspects of his characterizations with an understatedly tough and rather stubbornly determined manner, which made him seem mature enough to be a useful member of the good guys’ team. Whether he was being chipper or pugnacious, he was a lively and likable actor–and always did his best to raise the energy levels of the frequently under-energized serials that he appeared in. Ralph Stirling Hodges was born in San Bernardino, California. His father is listed on the 1930 federal census as a real-estate salesman, but by the time of the 1940 federal census was working in an auto-wrecking yard; this apparent decline in the family fortunes probably contributed to the Hodges’ decision to launch young Ralph on a career as a child actor in the late 1930s. 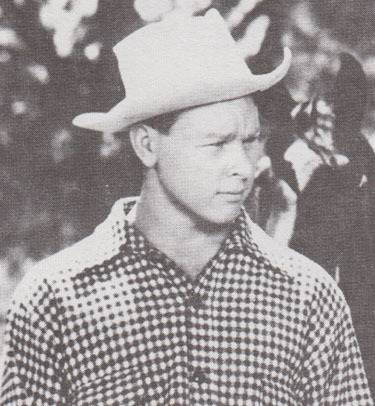 He made his first connection with the movie business at the age of 9, winning a screen test in a promotional contest sponsored by a dog-food company; an adept dancer, he subsequently appeared in several of the more musically-oriented MGM “Our Gang” shorts during the early 1940s, and also played bits in contemporary feature-length musicals such as Yankee Doodle Dandy and Holiday Inn. However, he never managed to rise above small parts during his childhood years; the mid-1940s found the now-teenaged Ralph still playing bits–usually dance-related ones–in various shorts and features (including It’s a Wonderful Life, in which he can be spotted during the Charleston-contest sequence). 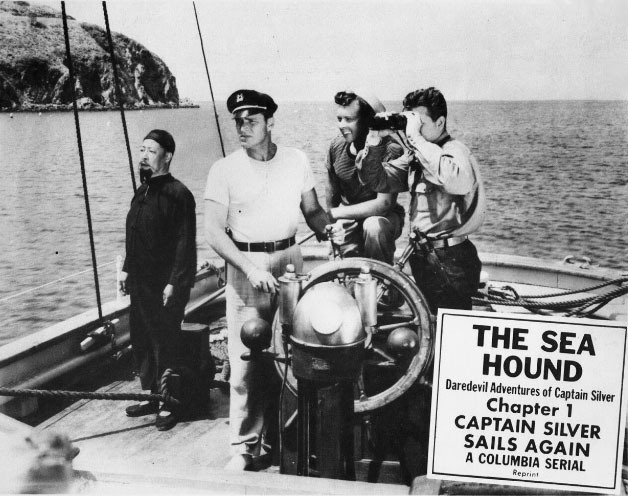 Hodges received one of his first credited roles in The Sea Hound (Columbia, 1947), a sometimes sluggish but reasonably interesting serial adapted from a popular radio adventure series and filmed in the Catalina Island area (Hodges would develop a lifelong love of sailing during this location shoot). The “Hound” of the title was a small schooner, skippered by Buster Crabbe’s “Captain Silver” and staffed by a three-man crew consisting of ex-cowboy Tex (Jimmy Lloyd), Chinese inventor Kukai (Spencer Chan), and youngster Jerry (Ralph Hodges); the seagoing quartet became involved in a search for a missing scientist and a lost treasure, and tangled with a gang of island criminals led by the sinister Admiral (Robert Barron). Though his character was the least colorful member of Sea Hound’s sidekick team, Hodges avoided being thrust into the background; his buoyantly cheery interchanges with his crewmates, his eager-to-please and slightly hero-worshipping attitude towards his doughty captain, his happy-go-lucky acceptance of adventurous situations, and his dogged courage in the face of threats from the Admiral’s men gave him more than enough personality to keep him from being overshadowed by his co-sidekicks. 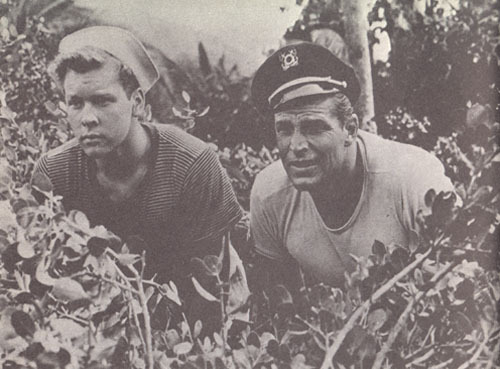 Above: Ralph Hodges and Buster Crabbe reconnoiter in The Sea Hound (Columbia, 1947). Above, left to right: Spencer Chan, Buster Crabbe, Ralph Hodges, and Jimmy Lloyd aboard The Sea Hound. 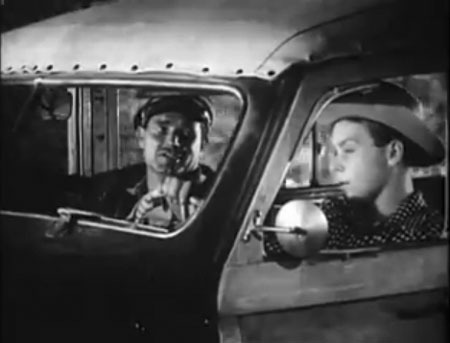 Like many a former child actor, Hodges had a good memory for dialogue and could get his lines right on the first take, a talent that recommended him to Sea Hound’s budget-conscious producer Sam Katzman; during the remaining years of the 1940s, Ralph would do most of his screen work at Katzman’s Columbia unit, playing both minor and prominent parts in B-features and serials. 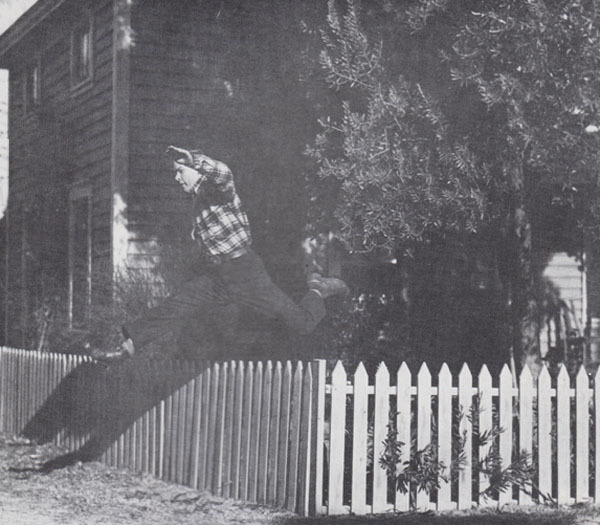 His next Katzman chapterplay was the engaging Superman (Columbia, 1948), in which he did a small but memorable turn as a teenaged Clark Kent during the serial’s long first-chapter origin-story sequence; within the space of his time on screen, Hodges’ Clark dramatically rescued his foster-father Eben Kent (Ed Cassidy) from a tornado and a loose high-tension wire–first seizing the live wire and tossing it away, then holding the elder Kent’s car firmly against a tree till the storm passed. Hodges’ concerned but energetically confident demeanor as he performed these feats helped to make them look believable on screen, and made his short-lived characterization mesh quite nicely with Kirk Alyn’s equally energetic performance as the adult Clark Kent in the main body of the serial. Above: Ralph Hodges as the future Superman (Columbia, 1948) makes a super-leap as he races to save his father. Hodges’ third and last 1940s serial was Bruce Gentry (Columbia, 1949), in which he was cast as a young rancher named Frank Farrell–who, together with his sister Juanita (Judy Clark), helped the titular pilot-adventurer (Tom Neal) track down a band of foreign agents and stop them from conquering the world with a fleet of flying saucers. Marred by unconvincing cartoon-saucer effects and an over-padded narrative, but enlivened by a good cast and some solid action scenes, Gentry was more than a little uneven–but definitely gave Hodges the biggest and best of his serial-sidekick roles; in Sea Hound (and in his next and last serial) he was just one member of a squad of supporting heroes, but in Gentry he was the hero’s only regular male aide, receiving plenty of screen time and figuring in plenty of action. He conveyed a level-headedness and self-reliant toughness appropriate to his rancher character, and also established a good rapport with both hero Neal and heroine Clark; his good-natured bantering with the two provided the serial with several of its brighter moments. Above: Tom Neal and Ralph Hodges in Bruce Gentry (Columbia, 1949). 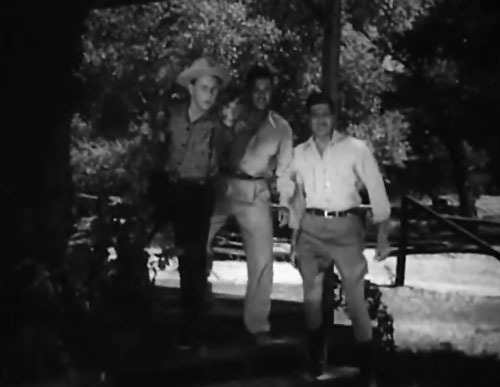 Above: Ralph Hodges points out some off-camera evildoing to Tom Neal (center) and Hugh Prosser in Bruce Gentry. During the early 1950s, Hodges played small roles in features at various studios (from MGM to Realart), appeared in a couple of Leon Errol comedy shorts at RKO, and made scattered appearances on early TV shows; he also maintained his foothold at Columbia, appearing in several Katzman features there through 1950 and 1951. In the latter year, he made one last Katzman-Columbia serial, Mysterious Island; easily the weakest of Hodges’ chapterplays, this weakly-plotted and frequently absurd “adaptation” of a Jules Verne novel told of a group of Civil-War-era castaways forced to battle pirates, a hirsute wild man, bizarrely-costumed natives, and anachronistic 1950s-style space aliens on an uncharted island. Hodges played a youthful sailor named Herbert Brown, a member of the harassed band of protagonists–and the one who was always most eager to confront or fight the weird denizens of the island. Hodges gave the outspoken and impulsive “Bert” a properly aggressive manner, but at the same time made him seem appealingly brave and good-natured; both his impetuousness and his affability contrasted well with the more sober and serious demeanor of Richard Crane, the serial’s leading hero. 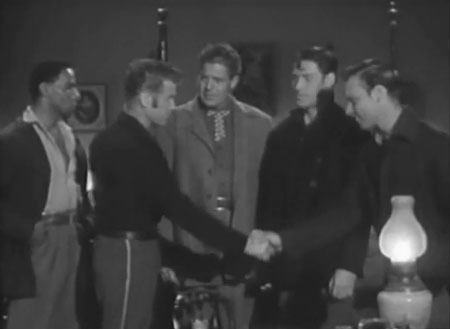 Above: Hugh Prosser (center) introduces Marshall Reed (second from right) and Ralph Hodges to Richard Crane (shaking Hodges’ hand) and Bernard Hamilton; together, the five are about to hatch an plan of escape from Confederate-held Richmond that will ultimately strand them on a Mysterious Island (Columbia, 1951). 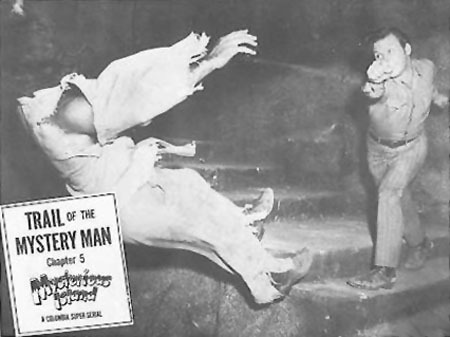 Above: Ralph Hodges slugs “wild man” Terry Frost in an action scene from Mysterious Island. Hodges went into the Air Force in 1951, and, save for a couple of TV appearances after his discharge, never got back into the acting business. Instead, he went behind the camera, and began a new career as a writer, producer, and director with the San Diego TV station KFMB. He stayed with this station for thirty years, overseeing (among other series) the long-running wildlife show Zoorama, which was filmed at the San Diego Zoo; he also made several trips to Asia and elsewhere as a documentary producer. After his retirement from KFMB, he devoted much of his time to his hobby of sailing, and also connected with fans of his serial work, both through the mail and at conventions. He passed away at his home in Big Bear Lake, California, in 2014. Ralph Hodges was never spotlighted as extensively in his serials as earlier chapterplay juveniles Frankie Thomas and Jackie Cooper had been in their solitary 1930s genre efforts, but his screen personality was more than a little reminiscent of those much better-known players. Like both of them, he managed to be convincingly and likably “youthful” without seeming either insipid or obnoxiously hyper, and came off as a credible participant in the dangerous game of cliffhanging. One never felt like questioning the wisdom of the serial heroes who allowed Hodges to assist them in their conflicts with the villains; the quietly scrappy youngster always seemed capable of pulling his own weight. Above: Ralph Hodges asks questions from atop his horse in Bruce Gentry (Columbia, 1949). Acknowledgements: This small but informative page of research on Ralph Hodges, an interesting article by Hodges himself in Boyd Magers’ online Serial Report (part of the Western Clippings site), and–especially–a phone conversation with Ralph’s wife Pamela provided me with the information utilized in this article.